← Climbing the Date Palm advances to the finals! In honor of Micah and all the real kids like him, ALL royalties for this novel until March JUNE 30 will be donated to Casa Ruby and Trans Life Line, so signal boosting is appreciated. 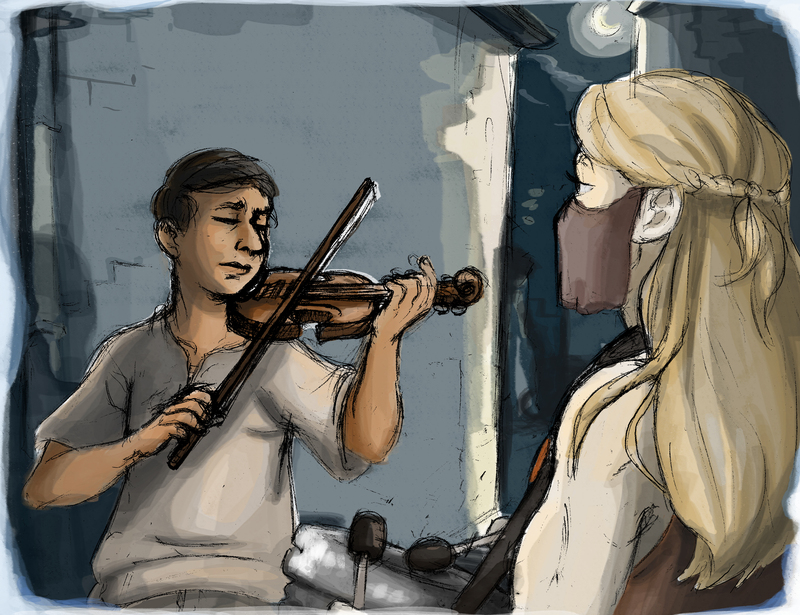 Micah, the AFAB trans street kid, jamming with the queen’s bodyguard Rivka in an alleyway at midnight on Shabbat in a scene from A Harvest of Ripe Figs. Illustration by Becca Schauer; book also available from Amazon. Note for people looking for non-tragic trans representation: his subplot has a happy ending. This entry was posted in Uncategorized and tagged afab, books, Casa Ruby, dfab, fiction, fiddle, ftm, glbt, jamming, jewish, lgbt, micah, music, musicians, shabbat, trans, trans charities, trans kids, Trans Life Line, trans youth, transgender, violin, ya books, young adult, young adult fiction. Bookmark the permalink.